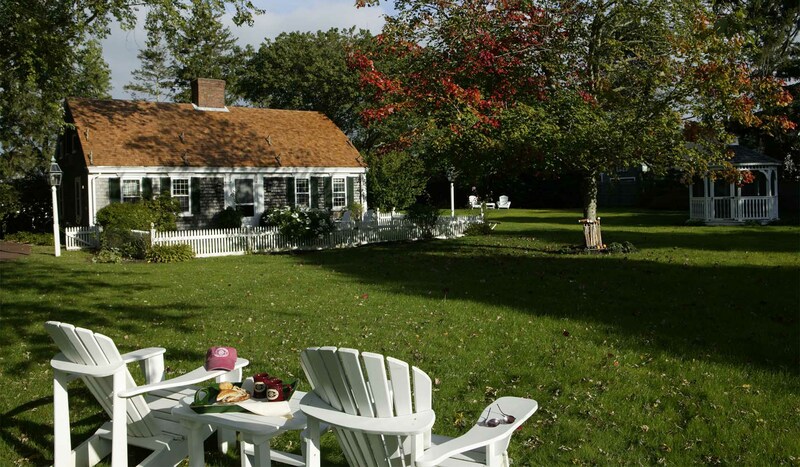 The Captain’s Cottage, one of the four guest houses that make up the Captain’s House Inn, is private and romantic. 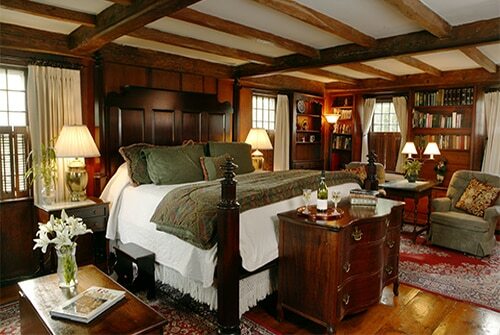 It offers three guest rooms: the Captain Hiram Harding Room, the Lady Mariah Room, and the Hideaway Suite. 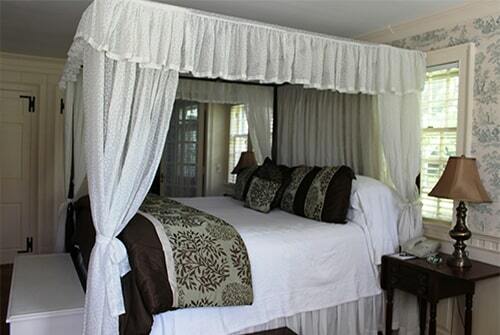 These rooms are perfect for anyone escaping to our Cape Cod bed and breakfast for a romantic getaway. 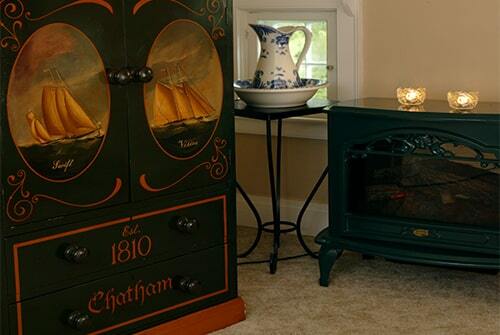 The Captain Hiram Harding Room is located on the first floor of our Captain’s Cottage. 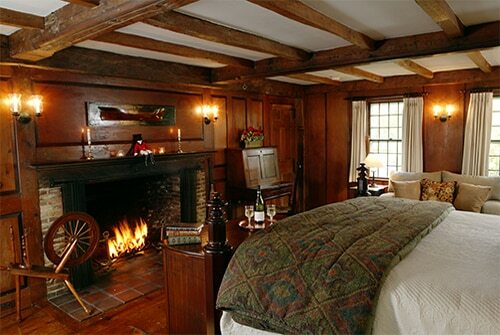 It is handsomely outfitted with original pumpkin floors, walnut walls, and beamed ceilings. The spacious room beckons you to relax with a king-size bed, two leather reading chairs, a love seat, and a large wood burning fireplace. 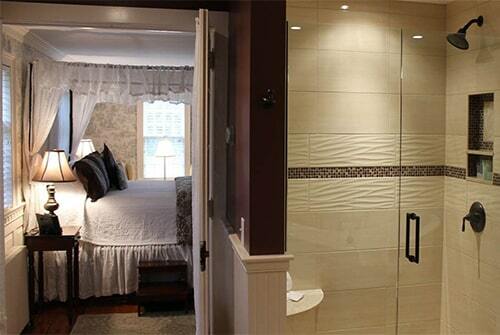 The private bathroom features a tubbed shower. Other amenities include air conditioning, a refrigerator, coffee maker, and TV/DVD player. 399 square feet. 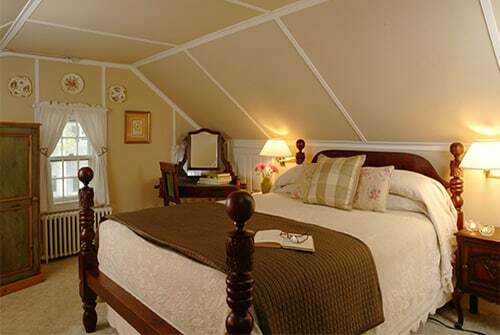 Located on the first floor of the Captain’s Cottage, the Lady Mariah Room is a spacious room, exuding romance with a king-size canopy bed and a palatial dream bathroom. The bedroom is furnished with two wing-back chairs, an electric fireplace, a flat-screen Smart TV, a refrigerator, and a coffee maker. 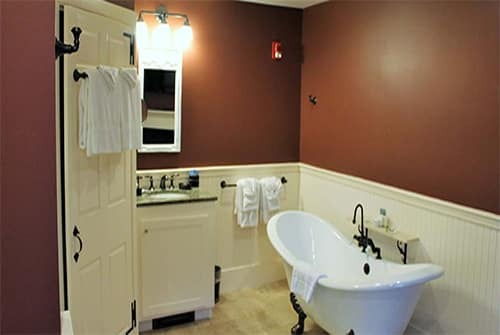 The roomy private bath features an oversized claw-foot soaking tub, a spacious shower, gas fireplace, flat-screen TV, and a leather chaise lounge. 483 square feet. 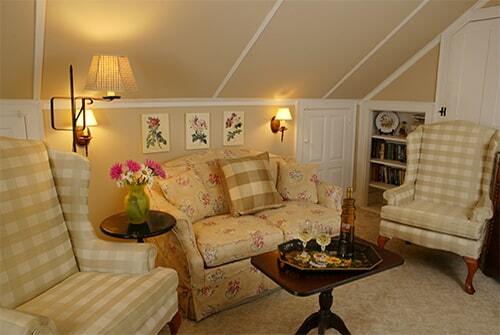 The Hideaway Suite is on the second floor of our Captain’s Cottage, in what was once the attic space. 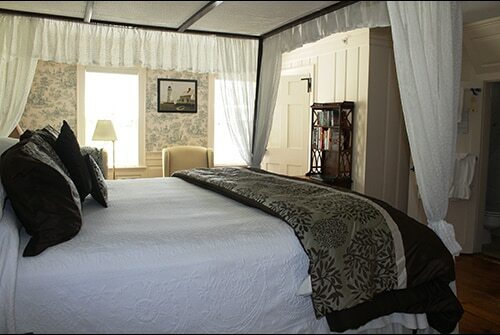 The bedroom features a queen-size bed, while the sitting area has a twin sleeper sofa and wing-back reading chairs. Both areas have TV/DVD players. Includes a private full bathroom. The guest room also has a gas fireplace, air conditioning, a refrigerator, and a coffee maker. We do not recommend the Hideaway Suite for women who are pregnant or anyone who is elderly or has a bad knee, etc. since the stairs leading up to the room are rather steep and some of the ceilings are low. Other than that, it is a charming, bright room and a favorite among those who appreciate the charm of an older home. 511 square feet.